Background: Carotid artery images indicate any presence of plaque content, which may lead to atherosclerosis and stroke. Early identification of the disease is possible by taking B-mode ultrasound images in the carotid artery. Speckle is the inherent noise content in the ultrasound images, which essentially needs to be minimized. Objective: The objective of the proposed method is to convert the multiplicative speckle noise into additive, after which the frequency transformations can be applied. Method: The method uses simple differentiation and integral calculus and is named variable gradient summation. It differs from the conventional homomorphic filter, by preserving the edge features to a great extent and better denoising. 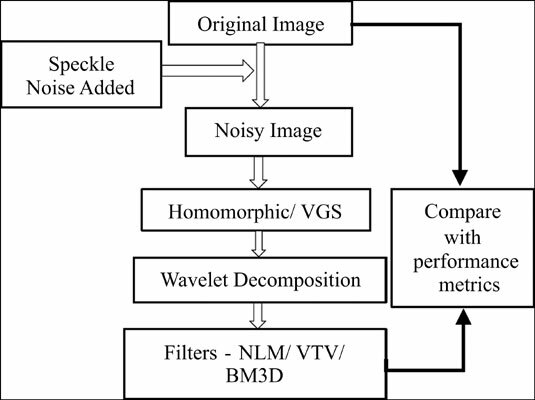 The additive image is subjected to wavelet decomposition and further speckle filtering with three different filters Non Local Means (NLM), Vectorial Total Variation (VTV) and Block Matching and 3D filtering (BM3D) algorithms. By this approach, the components dependent on the image are identified and the unwanted noise content existing in the high frequency portion of the image is removed. Results & Conclusion: Experiments conducted on a set of 300 B-mode ultrasound carotid artery images and the simulation results prove that the proposed method of denoising gives enhanced results as compared to the conventional process in terms of the performance evaluation methods like peak signal to noise ratio, mean square error, mean absolute error, root mean square error, structural similarity, quality factor, correlation and image enhancement factor. Speckle, denoising, carotid artery, wavelet decomposition, atherosclerosis, plaque.